German rabbi; born March 13, 1825, in Ratibor, Prussian Silesia; died July 9, 1890, in Johannisbad, Bohemia. While studying at the gymnasium of his native town he received his Talmudic instruction under Rabbi Loewe. At the University of Breslau classical philology and history formed his special studies (Ph. D. 1849). During an audience with the Cultusminister von Raumer in 1851, the latter gave the young candidate to understand that only baptism could entitle him to an appointment as professor at a college. Ritter thereupon accepted a position as teacher of religion and reader at the Berlin Reform congregation, becoming later assistant to the senior preacher of the temple, Samuel Holdheim. His first ten sermons were published as "Kanzelvorträge aus dem Gotteshause der Jüdischen Reformgemeinde" (Berlin, 1856), which placed him at once among the foremost Jewish preachers of his time. In 1859 his "Beleuchtung der Wagner'schen Schrift," published against "Das Judenthum und der Staat" by Wagner, member of the Prussian Diet, created a stir. 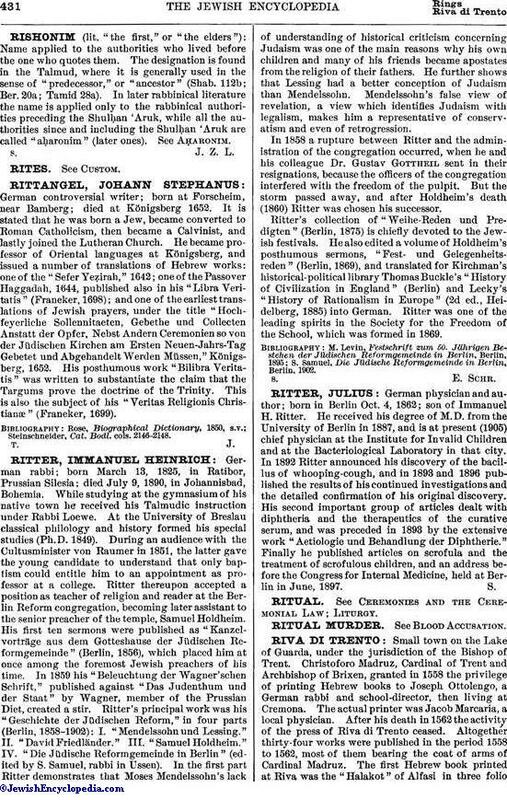 Ritter's principal work was his "Geschichte der Jüdischen Reform," in four parts (Berlin, 1858-1902): I. "Mendelssohn und Lessing." II. "David Friedländer." III. "Samuel Holdheim." IV. "Die Jüdische Reformgemeinde in Berlin" (edited by S. Samuel, rabbi in Ussen). In the first part Ritter demonstrates that Moses Mendelssohn's lack of understanding of historical criticism concerning Judaism was one of the main reasons why his own children and many of his friends became apostates from the religion of their fathers. He further shows that Lessing had a better conception of Judaism than Mendelssohn. Mendelssohn's false view of revelation, a view which identifies Judaism with legalism, makes him a representative of conservatism and even of retrogression. In 1858 a rupture between Ritter and the administration of the congregation occurred, when he and his colleague Dr. Gustav Gottheil sent in their resignations, because the officers of the congregation interfered with the freedom of the pulpit. But the storm passed away, and after Holdheim's death (1860) Ritter was chosen his successor. Ritter's collection of "Weihe-Reden und Predigten" (Berlin, 1875) is chiefly devoted to the Jewish festivals. He also edited a volume of Holdheim's posthumous sermons, "Fest- und Gelegenheitsreden" (Berlin, 1869), and translated for Kirchman's historical-political library Thomas Buckle's "History of Civilization in England" (Berlin) and Lecky's "History of Rationalism in Europe" (2d ed., Heidelberg, 1885) into German. Ritter was one of the leading spirits in the Society for the Freedom of the School, which was formed in 1869. S. Samuel, Die Jüdische Reformgemeinde in Berlin, Berlin, 1902.